(CNN) -- An Israeli patrol boat struck a boat carrying medical volunteers and supplies to Gaza early Tuesday as it attempted to intercept the vessel in the Mediterranean Sea, witnesses and Israeli officials said. 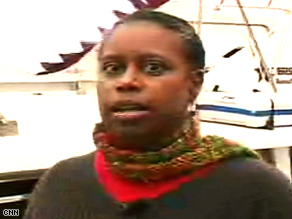 "Our mission was a peaceful mission," says former U.S. Rep. Cynthia McKinney, who was aboard the Dignity. CNN correspondent Karl Penhaul was aboard the 60-foot pleasure boat Dignity when the contact occurred. When the boat later docked in the Lebanese port city of Tyre, severe damage was visible to the forward port side of the boat, and the front left window and part of the roof had collapsed. It was flying the flag of Gibraltar. The Dignity was carrying crew and 16 passengers -- physicians from Britain, Germany and Cyprus and human rights activists from the Free Gaza Solidarity Movement -- who were trying to reach Gaza through an Israeli blockade of the territory. Also on board was former U.S. Rep. Cynthia McKinney. Penhaul said an Israeli patrol boat shined its spotlight on the Dignity, and then it and another patrol boat shadowed the Dignity for about a half hour before the collision. One patrol boat "very severely rammed" the Dignity, Penhaul said. The captain of the Dignity told Penhaul he received no warning. Only after the collision did the Israelis come on the radio to say they struck the boat because they believed it was involved in terrorist activities, the captain said. But Israeli Foreign Ministry spokesman Yigal Palmor denied that and said the patrol boat had warned the vessel not to proceed to Gaza because it is a closed military area. The captain and crew said their vessel was struck intentionally, Penhaul said, but Palmor called those allegations "absurd." "There is no intention on the part of the Israeli navy to ram anybody," Palmor said. "Our mission was a peaceful mission to deliver medical supplies and our mission was thwarted by the Israelis -- the aggressiveness of the Israeli military," she said. The incident occurred in international waters about 90 miles off Gaza. Israel controls the waters off Gaza's coast and routinely blocks ships from coming into the Palestinian territory as part of an ongoing blockade that also applies to the Israel-Gaza border. Human rights groups have expressed concern about the blockade on Gaza, which has restricted the delivery of emergency aid and fuel supplies. Tuesday's collision was so severe, Penhaul said, that the passengers were ordered to put on their life vests and be ready to get in lifeboats. The Dignity began taking on water, but the crew managed to pump it out of the hull long enough for the boat to reach shore. "It could have ended with people drowning if they hit us more square on," Dignity's captain, Denis Healey, said. "It could have gone down in minutes." Palmor said the vessel refused assistance after the incident. The boat was carrying boxes of relief supplies, volunteers and journalists to Gaza, the Palestinian territory that has been subject to an intense Israeli bombing campaign since Saturday. Israel Tuesday lambasted McKinney -- the Green Party's 2008 candidate for the U.S. presidency and a former Democratic congresswoman from Georgia -- for taking part in the maritime mission. In a written statement, the Consulate General of Israel to the Southeast, based in Atlanta, Georgia, said McKinney "has taken it upon herself to commit an act of provocation," endangering herself and the crew. "We regret that during this time of crisis, while Israel is battling with the terrorist organization of Hamas and defending its citizens, that we are forced to deal with Ms. McKinney's irresponsible behavior," the statement read. The trip was the Free Gaza Solidarity Movement's sixth in as many months. The Palestinian death toll has topped 375, most of them Hamas militants, Palestinian medical sources said Tuesday. At least 60 civilians have been killed in Gaza, U.N. officials said. Hamas has pontinued to fire rockets at southern Israeli towns since the airstrikes began, Israel says. Six Israelis have been killed -- five of them civilians. Hamas has vowed to defend Gaza in the face of what it calls continued Israeli aggression. Each side blames the other for violating an Egyptian-brokered cease-fire, which formally expired December 19, but had been weakening for months.